This slot, brought to you by NovomaticCasino.co.uk, mixes modern gambling with all things Ancient Egypt. Imagine if all those mummies of Ancient Egyptians were brought back to life and re-awakened in the heart of modern-day Las Vegas – and you’ll see that’s what this slot is all about! This slot is just a crazy, colourful mix of these two crazy worlds and the creation is something totally extra special and strange! Fans of our other slots: Fruit Fall and Book of Ra Deluxe, are really going to enjoy this mesmerising mixture of cultures! Just like its inspirations, Pharaoh’s Night is filled with features both old and new and is not one to be missed! The symbols are the craziest part about this slot game, no doubt about that! The lower-paying symbols are card value symbols: Jack, Queen, King and Ace, all designed in an ancient Egyptian-style font. There’s then a deck of cards, designed with ancient Egyptian Gods and Goddesses instead of Kings and Queens; a poker chip depicting a scarab beetle and a fruity cocktail served in an Egyptian goblet! There’s also a white cat; Pharaohs riding a Harley Davidson; Pharaohs riding in a sports car; a male Pharaoh talking on a phone and a female listening to some music from a smartphone. Crazy indeed! The aim on the game is to spin at least three matching symbols on an active winline in order to get a payout. 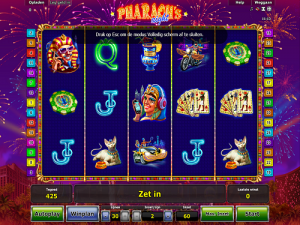 There are two extra special symbols in this slot game, one is Egyptian-themed and one is Vegas-themed! The Egyptian-style symbol is the Scatter symbol and it’s a sphinx statue, standing in front of an ancient pyramid. This symbol substitutes for all symbols except the Scatter symbol. The Vegas-themed Scatter symbol is extra special because it pays wherever it lands on the reels and can give you up to 50 free games if you spin 3 or more! During the free games, if you spin 3 wild symbols on the rightmost reel, they will expand to become one big sphinx statue, which will move to the left, one reel at a time, giving you so many turns at big wins! These free games can be seriously lucrative! As with most other NovomaticCasino.co.uk games, you can play for free until you’re ready to play with and win real money. Once you’ve got the hang of the game and you’re happy with your bet, which you can change by using the plus and minus symbols at the bottom of the screen, you can set the game to 'autoplay' and let the reels spin themselves. This slot doesn’t have a gamble feature but you don’t need it as this game is so generous anyway! Among our extensive selection of slots, we have some amazing jackpot slots! The jackpots regularly reach and pay out huge sums of money! These jackpot slots include: Jingle Jackpot, Lovely Mermaid and Fruits ‘n Sevens. We also have some fantastic table games and live dealer games for you to choose from. Our live dealer games are brought to you using the latest technology and enable you to play at a real table, with a real dealer, in real time! Load them up and play to make you feel like you’re playing in the heart of Vegas with our lucrative, live dealer games! Our selection includes: Live Baccarat, Live Blackjack, Live Poker and Live Roulette. You won’t find a more immersive or realistic experience with any other casino! Try out our live casino games today and see what all the fuss is about.